If you are currently searching for a new garden hose nozzle, then you are probably struggling. There is not a lot of valuable information on the internet about the topic because you only really need to purchase one if the one that you currently own is failing or if you need an additional level of functionality. What we will start by saying is that it is important to invest in one that you know is going to be good because a good hose nozzle will prevent any dirt and contaminants from splashing around your garden while the hose is in use. A good model will also be able to help with your water consumption rates. Try to remember that different spray patterns suit different activities and you should make sure that you choose a nozzle that is capable of handling what you need it to handle. Today we are going to be taking a look at some of the different products that are currently available on the market, in an effort to decide which of them really is the best garden hose nozzle and which are simply not worth your time as a gardener. We understand that choosing a garden hose nozzle is a difficult endeavor and we believe that you only need to think about one thing when you are doing so to make sure that you choose the right product; that thing is functionality. Is the hose nozzle that you are looking at functional in a way that suits your needs? If you are a gardener, then you should probably be looking for a hose nozzle that has a shower spray pattern or a mist option, but someone who simply wants to wash a car would probably be better off looking for a strong jet spray pattern. When you are thinking about functionality as a whole, as opposed to the functionality associated with specific situations, you should also be thinking about durability. You should try to make sure that you are choosing a hose nozzle that would be capable of surviving a drop because a range of different things could make you drop a hose nozzle, including slipperiness. We would also advise that you take your own comfort as a consumer into account. You need to start by thinking about how strong your hands and wrists are and whether or not the hose nozzle that you are looking at will be comfortable enough to use. The best hose nozzles can be put into a lock position so that you do not have to press down on a button constantly. If you know that you are going to be using your nozzle and hose for an extended period of time, you need to make sure that you can hold it for those lengths without it making you ache enough to drop it. 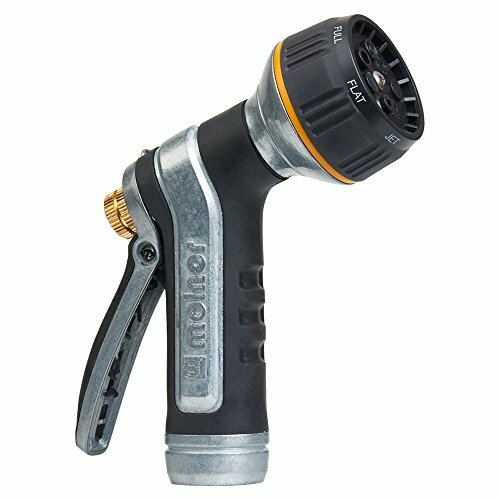 What are Some Advantages of Owning a Garden Hose Nozzle? There are a handful of key advantages that come with owning a garden hose nozzle, as long as the garden hose nozzle is a good one and not a dud. If it is terrible, then you should think about replacing it. In our opinion, one of the main advantages that comes with owning a garden hose nozzle is functionality. A nozzle makes it much easier for water to run to where it needs to go and different operating modes, like mist and shower spray, are suitable for different tasks. We are also happy to say that using a garden hose nozzle is something that will help you use less water. You might not be too conscious of your water consumption levels, but most of us use too much water regularly. Owning a hose nozzle means that water does not have to run constantly while the spigot is on and you will save money quite quickly because of this. A key factor that most gardeners forget to consider when they are thinking about purchasing a new product is aesthetic appeal. Most affordable hose nozzles are made out of plastic, but you can buy metal hose nozzles for a greater price tag. There are a few different benefits that come with doing this, including the fact that metal hose nozzles are unlikely to break if they are dropped on the ground. As a gardener, you should always try to consider the weather conditions and temperatures that your tools will be exposed to. Metal tools are incredibly unlikely to degrade in the sun and they are also unlikely to corrode if they are exposed to water, as long as they are properly cared for. It is also worth noting that the finishes on metal products can look incredibly attractive and metal is much more likely to blend within a typical garden. The VicTsing Garden Hose Nozzle is a fantastic example of what we have just mentioned about the differences between metal tools and plastic ones. It is an ergonomically designed metal nozzle that features 8 different spray patterns that can be used to handle a variety of different tasks. One of our favorite things about this product is the fact that it would be incredibly comfortable to use this hose nozzle for extended periods of time. It features a non-slip rubber grip that makes it easy to hold when covered in water and the trigger has been placed in a good position. It is also worth noting that this hose nozzle has a metal loop below the handle that helps to hold the lever down so that you do not have to worry about keeping it pressed down while you are working in the garden. This particular model is known to be strong and sturdy because it has been made out of metal. It can stand up to regular use and it could be used to frequently water your garden and any flowers that are present. 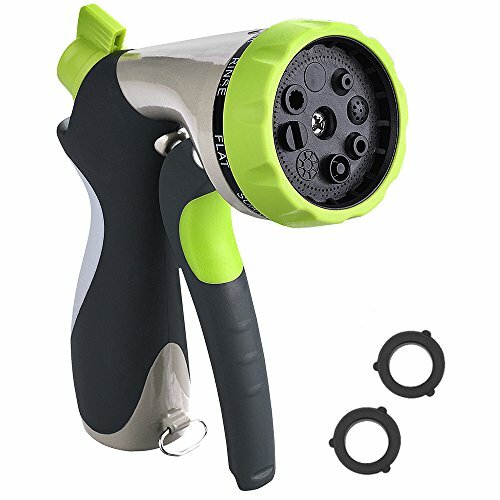 This product would also be a good option for washing your car and/or pets, as long as you use the right setting.With this hose nozzle, you are given the option to choose one of eight different adjustable spray patterns. These include a cone setting, a jet setting, a mist setting, a center setting, a shower setting, a rinse setting, a flat setting and a soaker setting that would be perfect for washing a car. You simply have to turn the spray nozzle dial to adjust the pattern. If you are looking for a really affordable product, then you should probably be looking for a plastic hose nozzle. Having said that, it is worth noting that this product is relatively inexpensive when you compare it to other metal hose nozzles. The Melnor Heavy-Duty Metal Hose Nozzle is another great example of just how durable metal hose nozzles can be when they are designed and manufactured properly. One of the main flaws that we do see sometimes with metal hose nozzles is a lack of comfort, but this particular model features a comfortable rubber grip. Having a rubber grip is important because it will not get slippery when wet. We would definitely recommend this product if you are planning on completing some heavy-duty tasks. It can provide you with a powerful jet of water that can easily be adjusted from a fine spray to a powerful jet stream, depending on what you need. One of the best things about this product is the fact that it has been designed with heavy-duty tasks in mind. This means that it is sturdy enough to last for a long time and it is durable enough to withstand the impact that it would be exposed to when dropped. It is worth noting that this product is so durable that it comes with a limited lifetime warranty. This hose nozzle also comes with a locking feature, so that you can lock it into a certain position without having to worry about holding your thumb down on a specific button. Some hose nozzles do feature a button that needs to be held down to maintain the flow of water in a specific way and they are known to make their users ache. As a metal hose nozzle, this particular product is really expensive when it is compared to plastic hose nozzles. As a user, you have to weigh up the pros and cons of both options and decide which one is the right one for your situation. 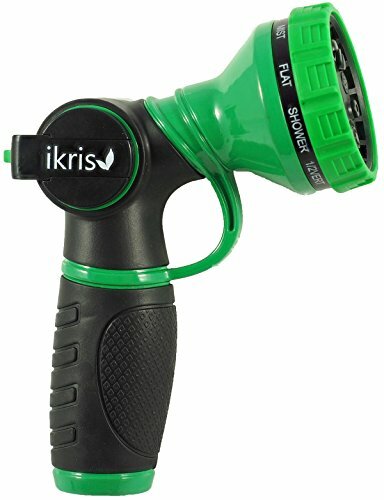 The ikris Garden Hose Nozzle is another fantastic example of a heavy-duty hose nozzle that has been crafted out of metal and designed to withstand general wear and tear. 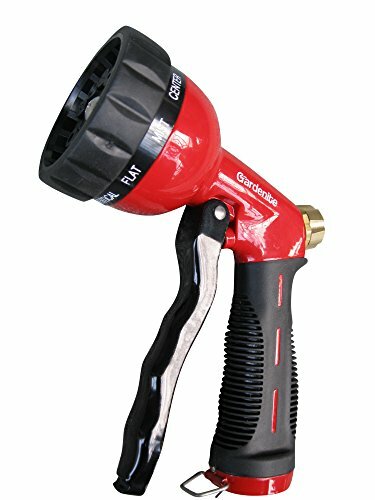 It features a 9-pattern water nozzle that really can be adjusted to meet your needs, regardless of whether you are looking to simply mist your garden or jet wash your car after trailing it through mud. The pressure for each of the 9 spray patterns that can be found on this model can be adjusted by using a squeeze trigger that can be found on the rear of this nozzle. You can then clip it in place so that you do not have to hold it down to maintain a specific flow rate. One of the first things that we would like to point out is the fact that the flow of water on this model is adjustable. This is a feature that cannot usually be found on affordable hose nozzles so it is quite exciting to see it on one that is this affordable. It can be used to control the water pressure for each of the different spray patterns, enabling you to swiftly move from a delicate shower to a high velocity jet stream with minimal effort. This hose nozzle has been made out of metal and baked enamel, which is enough to show us that it has been built to last. It is a lot stronger than a plastic nozzle would be and it would be much less likely to suffer because of the elements. Try to remember that metal hose nozzles will always be less affordable than plastic ones. If you are looking for something that is as affordable as it can be, then you should look for a plastic model instead of a metal one. 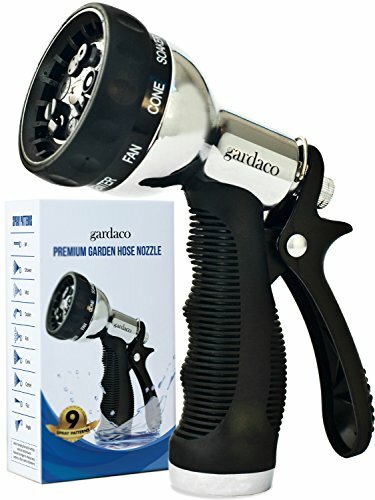 The Gardenite Hose Nozzle is one of the most aesthetically pleasing models that can be found on this list. It has been constructed out of metal and it has an enamel baked finish in the color red. This makes it stand out a lot more than a standard hose nozzle would. Given that this hose nozzle is made out of metal, it is just as durable as some of the other metal hose nozzles that have been featured in this article. It also has an ergonomic soft rubber grip so that it can be used for prolonged periods of time without your hands becoming fatigued. This Gardenite product comes with 10 different watering patterns that can be used to cover every angle that you need to cover as an experienced gardener. You could use some of the softer settings on everything from soft surfaces to pets and you could use the harsher settings to get rid of things like the grime and dirt on your car. The rubber grip that is present on this hose nozzle will be enough to ensure that your hand does not suffer from fatigue. The rubber will not become slippery when it is wet so you won’t have to worry about losing control either. This hose nozzle is relatively expensive. This will be enough to make some people turn their heads, but it is worth noting that this model does have the features that it needs to have to command a higher price. For example, it features a flow control knob that can be used to customize the water pressure. This is something that you would usually only see on more expensive models. SprayTec is a company that a lot of gardeners will be familiar with. 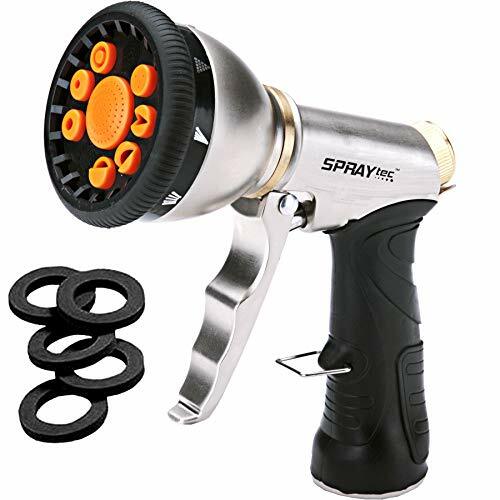 This SprayTec Garden Hose Nozzle is a great product because it features a metal body and trigger, but the trigger is covered in rubber to ensure that it remains comfortable and that it doesn’t become slippery when it is wet. Rubber washers have also been added to this product to provide a durable seal that prevents any water leaking in ways that it shouldn’t. The trigger itself is incredibly easy to squeeze and it can be locked in place so that you don’t have to keep squeezing it continuously. This can be incredibly useful if you have a lot of watering to do, meaning that we would recommend this product to people who know that they are going to have to water large areas of land or frequently use a hose. This SprayTec product has been built to last. We can see this because both the body and trigger that this hose nozzle has are made of metal, whereas a lot of metal hose nozzles still have triggers that are made out of other materials. The metal on the outer body of this product has an anodized finish to prevent things that include rust, corrosion and wear. You won’t have to worry about dropping this hose nozzle because the dial has already been prepared. It features a shock resistant rubberized dial. This means that the dial will not be affected by the impact in a way that other dials would. It is worth noting that this product is not as comfortable to hold as some of the alternatives that are readily available on the market. If you are looking for something that is more comfortable, then you should think about looking at some of the other products that are featured on this list. The Gardaco Premium Hose Nozzle is a little bit different to some of the other hose nozzles that we have featured. It has been made out of a type of premium aluminum, making it much more lightweight than steel alternatives would be. Aluminum is still incredibly durable and robust, but it is not as durable as steel and it could be dented if knocked hard enough. We love the fact that this hose nozzle has a silver chrome finish, which makes it stand out in a subtle way. It also features a leak resistant nozzle sprayer, nine different spray patterns and a twist nozzle that can be used to change the pattern that is in use. This hose nozzle comes with nine different watering patterns, meaning that it could be used by a variety of different people to complete a number of different tasks. You could use a light mist setting to go over your garden, but you could also use a heavy jet setting to clean some of the solid surfaces in your yard. This hose nozzle is also aesthetically appealing. The silver chrome finish that it has makes it look like a heavy-duty product, but in reality, it is a lightweight product that can easily be used for extended periods of time without a problem. The only problem that we have with the Gardaco Premium Hose Nozzle is the fact that aluminum is not as durable as some of the other materials that we can see being used to make hose nozzles. It is still durable enough to withstand most impacts, but we would recommend that you don’t throw it around your garden too much. Choosing a garden hose nozzle is difficult, but it becomes quite an easy task as soon as you know what you are looking for. Our favorite product on this list would have to be the Gardaco Hose Nozzle. It has everything that you need as a consumer. It is aesthetically pleasing with a silver chrome finish. It has a great level of functionality with 9 different patterns that you can choose from. It is user-friendly because it is lightweight and it can be used for extended periods of time.